No. Not that kind of ring. Though Tolkien did use this structure in his masterpiece, The Lord of the Rings. Ring structure or chiastic structure is a device to tell a story. An ancient device. It’s also one commonly used when applying literary alchemy, which I started to discuss here. If you haven’t read that yet, you might want to go do so. I’ll wait. So when Tim Coyne says that the opening scene and the closing scene of a book should mirror each other, he is referring to this sort of structure. It’s used in the Bible throughout many of the books, especially in Genesis. The reason you do it is that this structure feels satisfying to the reader, complete. The Hero’s Journey is a common example of ring structure. JK Rowling uses it deftly, with rings within rings. Yes, you can use rings within rings! If you’re planning a series it’s a good thing and will help you not only know which way to go next, it will literally build the series. You just have to understand the pivotal event. It should be an insight. This isn’t the climax of the story. This is the event or insight or lesson that changes everything, where the tide begins to turn. I’m a pantser, not a plotter, so for me this has meant going back and creating a scene map of my book and then working to create the mirror events. Where I have no mirror scene I need to make one. Currently, I’ve realized that one of my characters is missing his mirror scenes. So while I am nearly finished, I have a rewrite to do to fix it. It also helps me to order events. 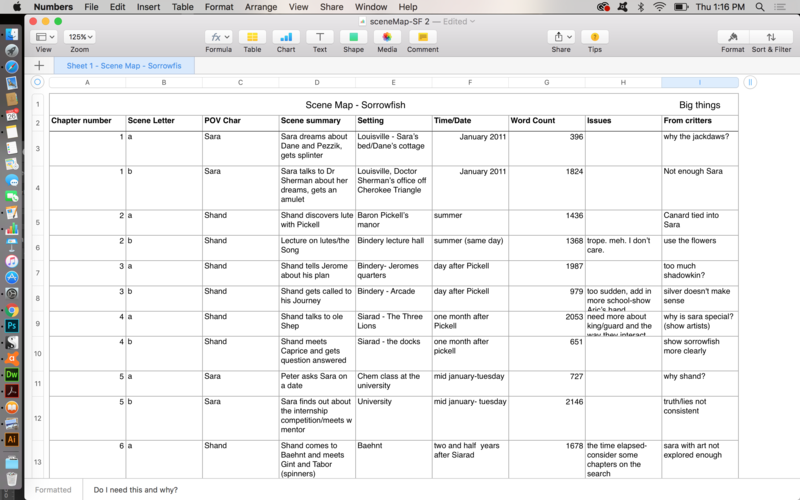 A scene map is a spreadsheet with pertinent info about each scene. That was my first scene map, pictured above. It’s pretty helpful. 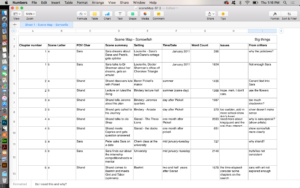 If you’re stuck or have no idea how to proceed with editing, it’s a fun thing to examine. Great article on the use of Ring Structure in Star Wars. The above link is super duper helpful with lots of different examples. I got a lot of comments and feedback on this first post on this topic, am planning to finish an entire series on it. Next we will looks at duality, which relates to ring composition but goes into even more detail, as you will see. Let me know if you use these methods!